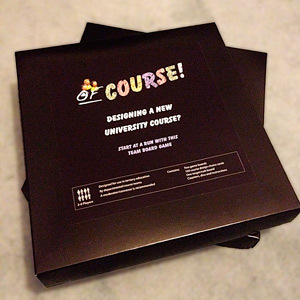 Based on extensive playtesting with real programme teams and games designers in higher education, the Of Course! 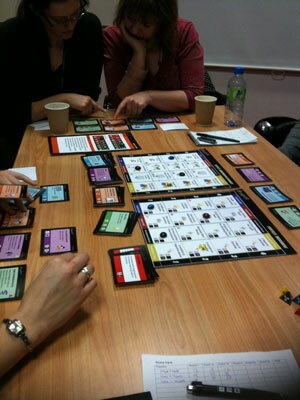 board game was developed to assist departmental staff in thinking about the wider implications of creating a new university programme. It has proved invaluable in starting conversations around real issues in market, student needs, design and delivery issues. The board game is best used at the start of the programme design process, when the course team, administrators, instructional designers etc. first meet to scope out the programme. It works best with a facilitator (an instructional designer, learning and teaching officer or similar) and 3-8 participants. Over a series of rounds, the participants try to construct a programme which closely matches the target market. As part of this process, they learn about various forms of pedagogic, administrative, assessment and delivery methods and how they compare in terms of budget and staffing needs. 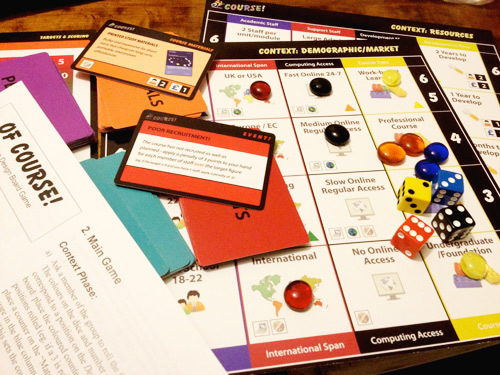 The various options, scoring system and a minor vindictive element (where participants try to break opponents’ programmes with real world events such as postal strikes or loss of internet connectivity) generate high levels of discussion amongst the group, which can then be carried over into the design stage proper. counters to place on the context and scoring boards: ten in total (ideally formed of two each black, blue, yellow, red and orange). 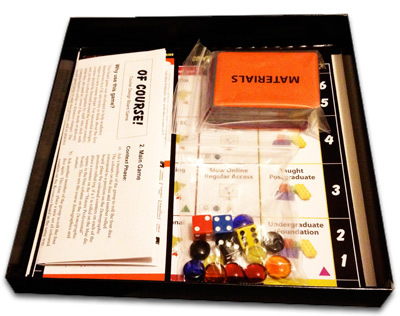 The board game is now available for use in other HE institutions in one of three ways. If you obtain the game and use or adapt it in your own context, I would be very interested in hearing how you’ve used it and the response from other staff. Note that GameCrafter are based in the US, and although they post internationally in secure boxes, the shipping costs can be high and may attract customs VAT charges. (2) If you’d like to recreate your own version for non-commercial use in an educational setting, I will be happy to send you the original image files for you to print out and collate into a game; you’ll need to add dice and counters. Contact me for details. Please note that the game should only be used for educational purposes in public universities, and cannot be used in private or commercial establishments or sold/repackaged/modified for distribution or commercial gain without contacting me first.